People diagnosed with personality disorders often present a high risk to themselves and others, particularly in mental health inpatient settings. In general, a procedural approach to risk management is adopted. While not without merit, this sort of approach can become something ‘done to’ service users and may even contribute to the escalation of risky behaviour. 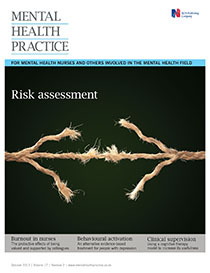 With reference to a case study, this article outlines a complementary approach to the assessment and management of risk, developed with an emphasis on relationships and recovery. The benefits of this approach for patients, families and staff are discussed.